How will it compare to the original Frank Capra classic? Everyone knows remakes are usually not as good as the original. Everybody in Washington knows that under capitalism, man oppresses man, but under socialism, it's the other way around. Even if they're not exactly sure in which Washington they currently are. There is a Capital Hill in Seattle. She'll fit right in there. She’ll make her stand at Starbucks with a big dramatic fillibuster until closing time when they finally call the police to kick her out. She is staying in New York until she gets her first Congressional paycheck as she cannot afford to rent her own apartment in Washington, DC. Wouldn't it be funny if we raised money for her and found an apartment in Spokane and flew her out there to waiting cameras? In the early 70s a graduate student at Indiana University ran for student body president on the Birthday Party ticket. His campaign plank was to rename every building on campus Ballentine Hall (the biggest classroom building on campus) so "you'll never be late for class again." He would have made a perfect press agent for Occasional-Cortex. She then proposed legislation to ban the state of Florida because it looks like a gun. How will it compare to the original Frank Capra classic? Everyone knows remakes are usually not as good as the original.She ain't no Jimmy Stewart! I know this because, when living in LA I received a call from him where he left a message for his agent regarding an event he was supposed to attend. I had a number that was often confused with many businesses, so this was understandable. At first, living in Hollywood, I thought it was a prank. It wasn't. Jimmie Stewart actually left a message on my answering machine. Didn't save because I'm not into that. Remember the movie David and Lisa in the 60s? The emotional story of a young man in a mental institution for teens who begins to understand his psychosis in the environment of others with mental and emotional problems. He finds intimacy with Lisa, a young woman suffering from dissociative identity disorder. And yes, as expected, it all goes downhill from there. A Plane is on its way to Washington DC, when Democrat Ocasio-Cortez in economy class gets up and moves to the First Class section and sits down. Cortez replies, "I'm a Democrat, I'm beautiful, I'm a Socialist, I'm going to DC and I'm staying right here." The flight attendant goes into the cockpit and tells the pilot and the co-pilot that there is a Democrat bimbo sitting in First Class, that belongs in economy and she won't move back to her seat. The co-pilot goes back to Cortez and tries to explain that because she only paid for economy she will have to leave and return to economy class. The co-pilot tells the pilot that he probably should have the police waiting when they land to arrest the future Congresswoman who just won't listen to reason. The pilot says, "You say she is a Democrat and a Socialist? I'll handle this; I'm married to a Liberal and I speak Socialist." The pilot goes back to the Democrat Socialist and whispers in her ear. Cortez says, "Oh, I'm Sorry," and she gets up and goes back to her seat in economy class. The flight attendant and co-pilot are amazed and asked the pilot what he said that made her move without any fuss. The Pilot answered: "I told her that First Class isn't going to DC." 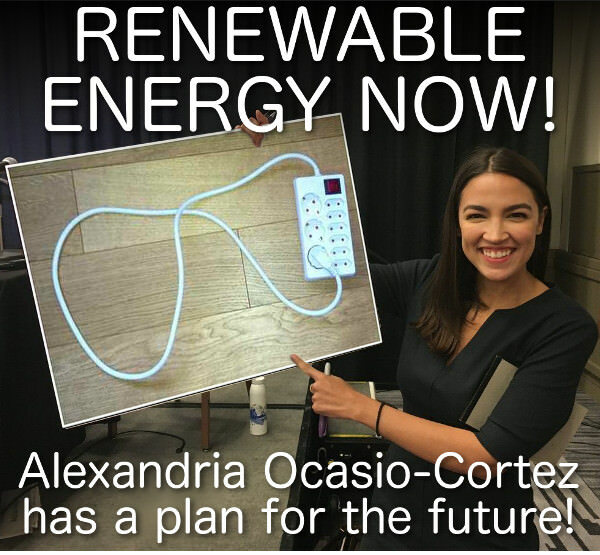 My friends, Comrades and fellow traveling countrymen: I think we have hit the Mother Lode of comedy with Ms. Ocasio-Cortez. Someone who apparently doesn't even know what the three branches of the Federal government are. OooRah! Perhaps it was her education that lacked? A quote from the "Nobel Prize winning economist" who is one of her senior advisors. This will probably not sit well with Alexandria. I bet she introduces legislation to outlaw this in the State of Bulgaria, a well known Republican stronghold. Santa remembered to get me the PPsH this year! Thanks, Santa! Ha! There is only one true rifle and Sergei Mosin is its prophet! Ivan is a Pelosi man... Hoorah Speaker! But hey, I'm definitely down for a PPsH. I agree entirely, PPG. But the PPsH is a submachinegun, so no heresy has been committed. ... no heresy has been committed. Ah? And is Comrade Mel Brooks appointing you Inquisitor in Charge of Armory Orthodoxy to proclaim nihil obstat on not-loud weapon without dog collars or bayonet and also not being equipped with 1500 arshin rear sight, eh? I smell Trotskyism! The other Ivan is in a jar. He doesn't get out much. Is it time for Ocasio-Cortez "Poor Me" issue? Ideas / headlines are welcome. How about a clock, Red Square? Well now, YOU GO GIRL! This is what I call taking the Meme War to a whole new level and throwing your new found power around. Looking floorward to your subpoena of that punk Don Jr. and many, many others. I'm just not sure how she is going to get any work done if she subpoenas everyone that does an unflattering meme about her. Perhaps it would be better to ban all memes except for state approved memes. Problem solved. "That'll be MISTER JUNIOR to you, Ms. 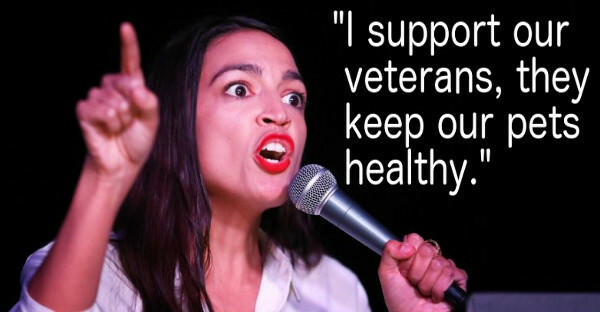 Cortez!"